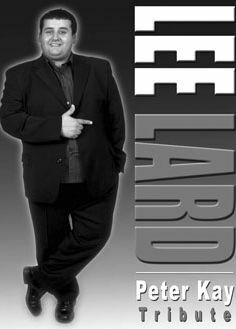 After enjoying tremendous success with his comedy duo Lean & Lard, Lee launched his solo Tribute to PETER KAY. As the only Peter Kay Tribute in the country, not only does he look like him, and sound like him, but we're sure that many audiences will wonder if it really is him! Delivering an hour long show, Lee Lard's - PETER KAY EXPERIENCE offers all audiences a rare chance to experience the unique stand up comedy of this exceptionally funny man and a guest appearance from Brian Potter of Phoenix nights! The show has gone from strength to strength in a very short period of time and is 'selling out' at venues throughout the UK.